With a few easy steps, you can e-file your 1099-MISC form(s) instead of filing manually. After going through the QuickBooks Desktop 1099 Wizard, QuickBooks Desktop will connect to the Tax1099 service and import your data. This article covers the 1099 e-file process for QuickBooks Desktop. NOTE: QuickBooks Desktop for Mac does not support e-filing of 1099s. You can print 1099s and 1096s. Step 1 of 4: Complete the QuickBooks Desktop 1099 Wizard. For detailed steps, refer to QuickBooks 1099 Wizard. To set up or add contractors/vendors in QuickBooks Desktop, refer to Set up a 1099 Independent Contractor/Vendor and print 1099/1096 forms. On the Tax1099 landing page, select Log in or Sign Up to start with Tax1099. Enter the necessary information for sign up. Click the Captcha checkbox. Once the set of images appears, select the ones that are relevant then click Verify. Click Register or Let’s Go! This directs you to the Tax1099 Dashboard. Step 3 of 4: Import your QuickBooks 1099 Data. Important: Depending on your computer and network setup, there are different options to import your data into Tax1099. Select Import > QuickBooks Desktop and follow the on-screen wizard to determine which one of the following methods you need in order to upload your data. 2: Import your data by using the Tax1099 plugin.﻿. After uploading, you are taken to the Tax1099 Dashboard. A red flag implies a correction is needed. Click on the vendor name or the Editbutton to edit the information. To determine the name that will be pulled into Tax1099 and appear on the 1099-MISC forms, refer to this Tax1099 article. Changes made in Tax1099 do not flow back to QuickBooks Desktop. Fill in the necessary information and click Update. After updating the information, you are routed back to the Tax1099 Dashboard. 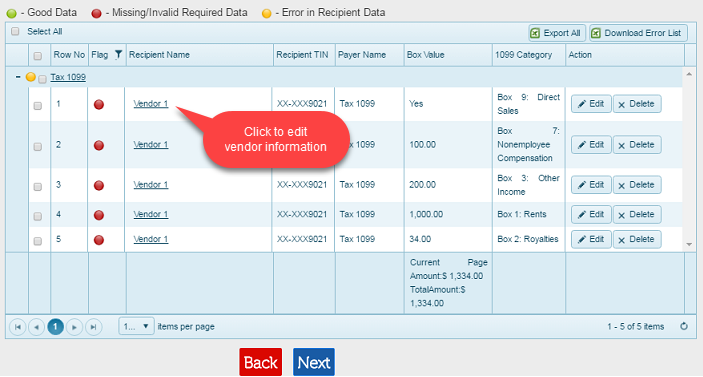 Select the vendors you want to upload to e-file by checking the box. Click Next, when you are sure of your selection. Tax1099 will check if there are still errors on the forms before uploading. If there is an error, a pop-up message notifies you about it so it can be corrected before filing. Once the error is corrected, select the vendors again and click Next. If there are no errors, an Uploaded Successfully pop-up message appears. Click OK.
Prepay Now is typically used by Accountants. If you select Prepay Now, you can add funds to a Prepay account. This allows you to debit your prepay account every time you file forms, otherwise you have to enter your billing information each time you file your forms. Important: There are additional steps that need to be taken by employers who need to file with their states before proceeding to the next step. For example, employers who do business in Wisconsin or New Jersey or pay contractors living in WI or NJ . Click here to know more. Select the vendors by checking the box next to the Date column. Choose how you want to send copies to the recipient/vendors by checking the box under USPS Mail or Email Recipient. You may also click on Download Multiple PDF to provide vendors their copies yourself. NOTE: There is a fee if USPS Mail is selected. At this point, you may click Next to proceed or click Calculate Tax1099.com Fee to see the total filing fee. If you click Calculate Tax1099.com Fee you are presented the screen below. When you click Next, a few different pop-up messages may appear. If you chose TIN Matching for any of your vendors and the TIN Matching is pending for any of your vendors, the message below appears. You can either click Cancel and wait or click OK to continue with billing and e-filing. If you have not chosen USPS Mail or Email to send recipient copies, the message below appears. You can click Cancel and select the method for sending the copies to the recipients, or click OK to continue and notify the recipients yourselves. If you changed the schedule date for filing to the IRS by clicking Schedule Date for all Vendor Files to IRS, the pop-up message below appears to notify you how recipient copies will be handled. Click OK to continue. When you are finished with the options on the Select Forms page, you are taken to the Payment page. There are five boxes shown on this page. These boxes provide you the total fee, a breakdown of the E-Filing fee summary, and fields to enter credit card and billing information. Once all billing information has been entered, select Pay & Submit to E-File. A Payment Confirmation is provided, as shown below. You may submit more records from this page by clicking the Click here to submit more records button. From the menu, select History. Select Filing History to see all submissions and their current status. From the Filing History page, select Click here on any of the forms previously filed. You will be taken to the Manage Forms page which shows you the status of each form submitted. On the Manage Forms page, go to the Action column and select View/Print from the drop-down. A pop-up window allowing you to select which copies you would like to View/Print appears. You can then view, print or save copies of the form. You can also check the meaning of each status in the Tax1099.com Support site. Certain states, like New Jersey and Wisconsin, have state-specific requirements for boxes 16 & 17. You can fill in these boxes in Tax1099 prior to e-filing. Tax 1099 allows you to enter your Box 16 and Box 17 information manually. In the Select Forms Page, identify which of your contractors need to be filed with your state. Under the Action column, click Edit. Enter the information under Boxes 16 (State Tax Withheld) and 17 (State/ Payer’s State no.). Clicking the State ID Field in Box 17 will prompt you the format that you need to follow when entering the ID. Click Save & Continue and do the same for your other Wisconsin contractors. Proceed to Step 3 of 4 in E-filing Forms and Billing. See How to file 1099s with my state using QuickBooks Desktop on how to be compliant. Where can I see my submitted forms? Once you’ve created and submitted your forms, you may find you need to view, print, email, or mail them. Follow the steps in this Tax1099 article to perform any of these actions. How do I check the submission status of my filing? There are several ways to check the status of your submissions. Click here for detailed steps. How do I edit the information of a vendor in Tax1099.com? A vendor is called a Recipient in Tax1099.com. The Recipient is the person or company receiving a payment from a Payer. You can add, edit, and delete Recipients under Manage Recipient. Since you are using QuickBooks Desktop and the information gets imported to Tax1099.com to e-file the 1099 form, the Recipient will be created automatically. You can check this Tax1099 article for the steps on editing a Recipient. How do I upload data from multiple QuickBooks company files into Tax1099? For instructions on uploading or importing data for another company file, refer to this Tax1099 article. When you open the second company file, the Application Certificate window should appear, like in the Setup steps above. Then check the box Allow this application to access personal data such as Social Security Numbers and customer credit card information and click Continue. If the Application Certificate window does not appear, go to Edit > Preferences > Integrated Applications page and follow the steps in this Tax1099 article. When you open the company file, the Application Certificate window should appear, like in the Setup steps above. Reason #1: The QuickBooks Desktop preferences does not allow other applications to access the company file. On the left pane, select Integrated Applications then go to the Company Preferences tab. Uncheck the box Don’t allow any applications to access this company file then click OK. If the Application Certificate window still does not show after performing the steps above, proceed to the steps under Reason #2. Open QuickBooks and wait for the Application Certificate prompt to appear. If the steps above do not work, proceed to the steps under Reason #3. Close QuickBooks Desktop. After closing QuickBooks Desktop, check the Windows Task Manager for any QuickBooks Desktop instances. On your keyboard, press and hold Ctrl + Shift + Esc. In the list of processes, look for qbw32.exe, highlight it, the click End Process. Reason #1: This can happen if you selected the wrong option when the application certificate window pops up the first time you open QuickBooks Desktop after installing the plugin. Make sure the Don’t allow any applications to access this company file box is NOT checked. In the list of application names, look for Tax1099, highlight it and click Reauthorize. Check the box Allow this application to access personal data such as Social Security Numbers and customer credit card information. Check if the Tax1099 option is now available under the Vendors menu. Reason #2: The Tax1099 is not marked as checked under Integrated Applications. In the list of applications, put a check mark on the Allow Access column for Tax1099. Aside from plugin issues, possible data damage may also prevent you from importing vendors to Tax1099. Try the steps outlined in this Tax1099 support article or this Tax1099 support article. If the issue persists, proceed to the following steps. From the Reports menu, select Vendors & Payables then click 1099 Summary. On the 1099 Summary report, look for a vendor with minimal transactions. Open one transaction that meets the threshold then verify the account used for it. Create a new expense account and use it in place of the account originally used for the transaction. Run the 1099 wizard and map the new account. Once the import is complete, go back to QuickBooks. Merge the old and new expense accounts. Note that you need to un-map both accounts in 1099 before you can rename/merge them. Run the 1099 wizard and map the merged account. Upload the data to Tax1099.com. Complete the process for all expense accounts used for 1099 vendors. Tax1099 recognizes vendors and adds up amount based on EIN. As such, the number of vendors may decrease and the transaction amount may be different once the data is uploaded to Tax1099. Compare the two reports by vendor name and amount. If there are two vendors in QuickBooks recognized by Tax1099 as one, you can merge them until you get the same number of vendors and threshold amount for both reports. If only part or some of your vendors are importing or no forms are reporting, or vendors are missing, you could be missing a tax id (TIN). See this FAQ for more details. If you do not have a TIN for your vendors, you may need to withhold backup withholding. See ee the IRS Instructions for the W-9 for details.